When it comes to drama by the sea, few places on the west coast are as dramatic or as impressive as the coast of central Oregon. With its rugged rocky shoreline and huge crashing surf, the coast is absolutely stunning. There's so much to see that it could be overwhelming to the solo traveller or photographer. What to see? Where to start? That's where we come in. 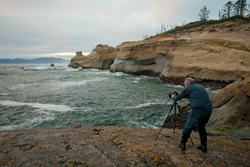 Aperture Academy instructors Brian Rueb and Kevin McNeal met a group of 10 enthusiastic photography students in beautiful Lincoln City, Oregon for a weekend of fun, education, and photography on the Oregon Coast. The group met under sunny skies on a beautiful Friday evening for orientation so the class could get to know the instructors more, and the instructors could get to know the students and what they wanted to work on during the course of the weekend. The class was a great group with a lot of previous experience, and they were looking forward to getting out and capturing some awesome images. The night has a funny way of changing the weather along the coast. The day ended with warmer temperatures, and clear skies. The morning brought drizzle and lots of it. Kevin and Brian have been photographing long enough to know that weather can change quickly, and dark moody skies can still bring dramatic images. 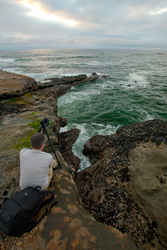 The first location was a small set of sea stacks on one of the many small inlets on the central coast. These sea stacks have small trees growing out the top, and that resemble bonsai trees. The rain hadn't reached this far south yet, and the sea stacks and trees were still reflecting beautifully in the calm water of the bay. The class spread out along the shore to work on setting up their ideal compositions. Vertical, or Horizontal the images were really looking nice. The lack of morning light left the scene cool and in the morning twilight the silhouettes of the sea stacks really stood out. 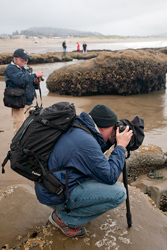 Kevin and Brian walked up and down the coast to really help the students with the fine points about composition, as well as the settings needed in order to capture the scene. 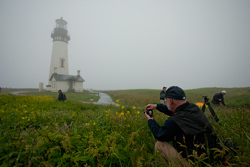 The second stop of the morning was one of the beacons of the coast, The Yaquina lighthouse. The best way to see and photograph lighthouses is to place them in their natural element…the fog! Lucky for us there was plenty to share. 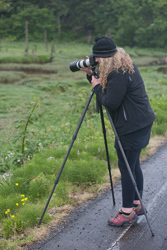 The class spread out, camera covers in place, and looked over the scene for the best compositions that showcased the areas lovely wildflowers that they could be used to create an interesting foreground for the lighthouse images. The main issue at hand (other than the drizzle) was the wind. The wind is a constant factor on the coast. Kevin and Brian worked with the class on how to increase the ISO in their cameras to get a fast shutter speed that would allow them to stop the motion of the flowers in the wind. 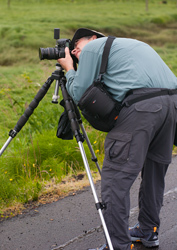 Often in images the key to success is sharpness throughout the frame, and wind can ruin that very quickly. When the lighthouse had been photographed and the class was finished with the area, it was time for breakfast at a little joint called the Pig n' Pancake. The group had a good time warming up, cracking jokes, and eating a nice breakfast before heading out again for the afternoon shoot. The afternoon was all about trees. One section of highway one has some great old tree skeletons sitting in a lush green field. When you combine these trees with some moody coastal hills and some moody coastal fog, you have potential for some great images. Brian and Kevin took helped the group a lot with composition in this location and how to really fill the frame to get the most of the scene. Using curves in the small creeks and waterways to lead the eye through the image and an old dead tree as the subject of the shot, all it takes are foggy mountains in the background and the image is complete. Unfortunately, drivers passing us on the road didn't see what we saw, and stopped or slowed constantly to see if we were watching elk, or anything that seemed interesting to them. 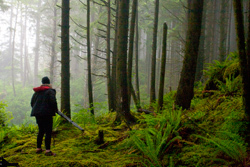 The tree theme was popular, and the next stop was deeper into the coastal rainforest. 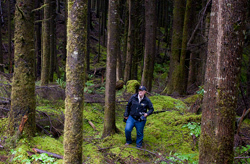 We pulled the ApCab over on a small turn out and a few of the students followed Brian and Kevin into the trees to look for some great compositions to show off the moody forest. 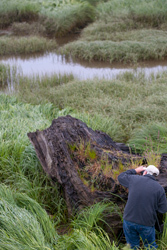 These kind of shots can be tricky to capture in a way that gives depth and impact to the shot, so Brian showed a few of the students how to use smaller trees or stumps as reference points to create depth and scale. The rain had begun to fall far more now than in the morning, and many of the students, while intrigued by the location, opted for the dry comfort of the ApCab. When the students who braved the rain had finished photographing the forest, it was time to head back for the afternoon break. During the break Kevin and Brian discussed their processing techniques and answered questions on how to get the most out of images once they were at home on the computer. Afternoon break was deserved, and much needed as many students caught a nap to help combat the effects of the early morning departure time. 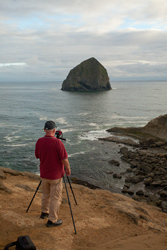 It also charged up those batteries for our last shoot of the night, the iconic Cape Kiwanda. 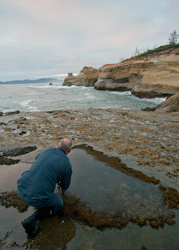 With golden sandstone cliffs eroded by the smashing of waves and wind over time, Cape Kiwanda has instant impact. The sky was still not cooperating, but the rain had stopped for the moment, so the class was eager to get out and capture some images. 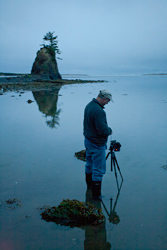 On this night we worked the south side of the cliffs and some of the interesting curves, and gaps in the rocks visible due to the lower tides. Many of the students in this class had quite a bit of photography experience. 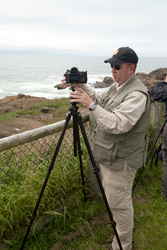 Brian and Kevin really tried to help them to 'see' the compositions in the area, so they could start to find the best ways to capture locations on their own. The use of leading lines in the bottoms of the images, how to fill a frame with foreground, middle ground, and sky, etc. Some students used the swirling surf and long exposures to help put movement in the images to help the eye flow through the composition. The more we photographed the darker the sky, and soon our luck ran out and the rain returned, ending the photography. On the flip side, we were also parked next to the Pelican Pub, where we could eat and recap our day together over laughs, and a few adult beverages. This group was always in high spirits even in the worst weather. It was evident over dinner from all the laughs and fun the group was having. Laughter and fun has a price though, and it was nearly 11pm by the time we arrived at the hotel….and it was another early rise in the morning to make a chance at sunrise. The weather was looking to improve, and we were going to make sure we put forth every effort to have a chance to photograph it! The long day before took a toll and a few people opted to sleep in rather than make the attempt to capture sunrise. Those who braved the lack of sleep were treated with a great morning of photographing something different. We do so much landscape work on typical adventures that we often forget that a location is much more than just the landscape. The Newport Harbor is a great piece of the Oregon coastal pie. 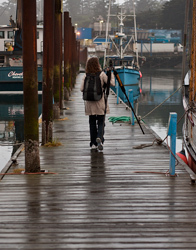 Old ships that supply the area and west coast with fresh fish and seafood are great sources for photography. The reflections they cast in the bay, or some of the old pieces of fishing history that are part of the boat, or tackle. 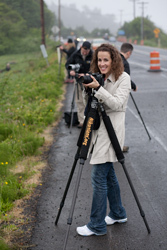 It's a style of photojournalism in a sense. By photographing scenes like this a photographer ads images to give a better overall impression of the location as well as adding images to a portfolio that could be very successful stock type images. The class wandered the docks looking for interesting and intimate details of the ships for a couple hours, and even had some brief glimpses of color and sun as the storm began to break. We weren't alone in the area either. A group of seals could be heard nearby having their morning arguments. When we had exhausted the shooting at the docks, we drove over to see these seals and give them their close-ups. One large male even gave us his best college student impersonation and barfed for us. Typical of a young male, he didn't clean up his mess either, and left his barf on his chin for everyone to enjoy. The seals were only 20 feet away, and the class got some great close up images of their faces (barfed on and not barfed on) it was a great way to squeeze in some minor wildlife photography without the miles of hiking, and hours of waiting it normally involves. Another morning of photography followed by another morning breakfast at the Pig n' Pancake. Life is good! When breakfast was over, some of the class expressed interest in going back to the rainforest from the day before to get a chance at capturing something special there. Brian took those students who were looking for their own forest image back to the forest of Endor (Star Wars reference, sorry) while the others took the opportunity to take a nap and recover from the early morning. Afternoon took us to a few of the coasts scenic vista points where photography was not necessarily the focus of the stop. 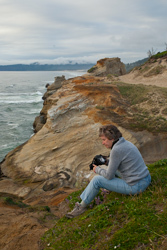 Even though the locations were photographed by the students, sometimes it's nice to just sit, enjoy the warming weather, and watch the rugged coastline get pummeled by waves. It was a great way to enjoy the day. The day was capped by a great lunch, more laughs, and ice creams at Coldstone. 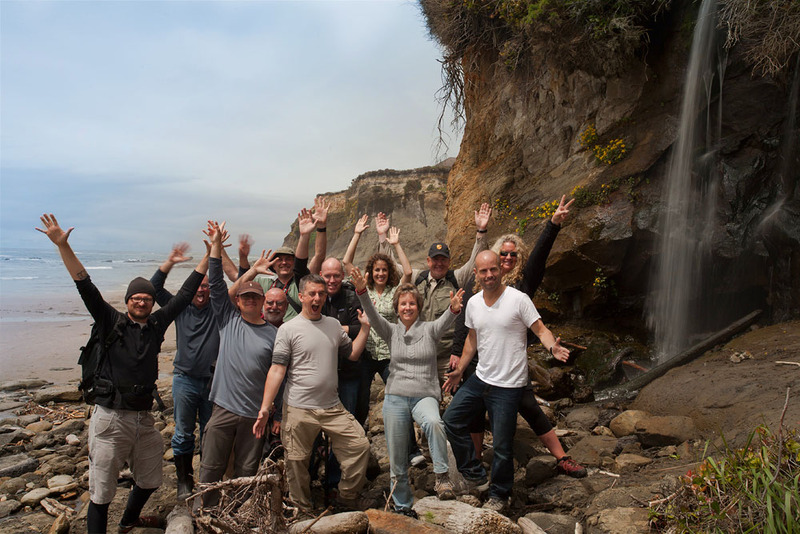 The class camaraderie level was very high and everyone was looking forward to the possibility of another chance at Cape Kiwanda for sunset. The day had grown progressively better weather wise, and tonight was the time to head up to the top of the cliffs and see some of the power of the Oregon coast as the larger waves blasted the sandstone curves and created all kinds of movement and interest. The group braved the grueling sand hill climb to the top (which was good for those of us who were reeling from too much ice cream) once on the top, Brian worked with every student to find compositions that suited their desired location. 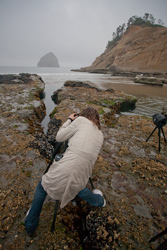 Some students felt more comfortable shooting higher vantage points that took in the whole coast and some of the interesting sea rocks. Others wanted to get up close and personal with the area and climbed down to the sea shelf below to get waves action in their foregrounds or some of the really interesting tidal pools full of star fish and anemones. The sunset never went into neon color mode, but the sky had broken enough to get some great warm tones, and even some hints of pink in the upper regions of the sky. It was certainly enough to get some definition in the sky, and create more dynamic and interesting images. This was by far the classes' favorite location and they enjoyed watching the waves really smash the cliffs. Some parts the waves were so tumultuous that they actually smashed into each other, sending huge splashes high into the air. The class stayed until the last of the light had faded. 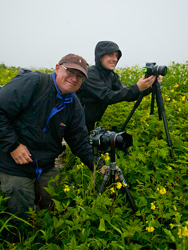 Even if they weren't taking photos they enjoyed just being out in nature in one of the country's wildest coastlines. Once again when the shooting was over it was time to head back to the Pelican Pub and recap the day, and weekend together. It was such a fun group everyone was a bit sad that the time together had to end, and everyone had to go back to their respective lives. That's what these weekends are all about! 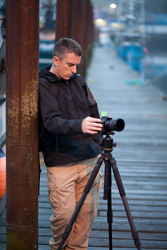 Fun, Education, and Photography with groups of likeminded people! Until next time...Brian, Kevin and the rest of the Aperture Academy team!